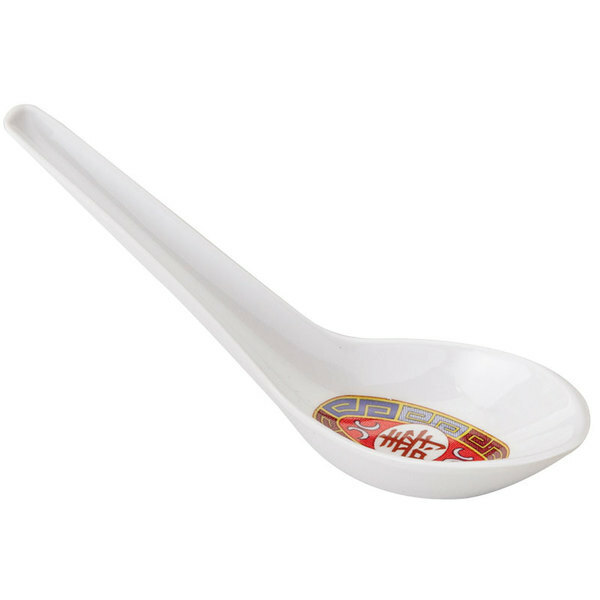 Enhance the authenticity of your Asian-inspired cuisine with this GET M-6030-L Dynasty Longevity soup spoon! This spoon's classic white color ensures your colorful menu items pop for an eye-catching presentation, while its multi-colored, oriental design adds a touch of authenticity to any tabletop setting. Its deep bowl makes it perfect for use with your signature wonton soup or miso soup, but its versatile 0.65 oz. size can also be used to display delicate desserts and small appetizers. Plus, its long handle is easy to grasp for added user comfort. Featuring a break-resistant melamine construction, this sturdy spoon is designed to stand up to any fast-paced environment while still offering a professional feel. A great addition to your restaurant, bistro, or catered event, this soup spoon is the perfect piece to create an authentic dining experience that's sure to impress your guests!